Italian food has become part of the American diet. 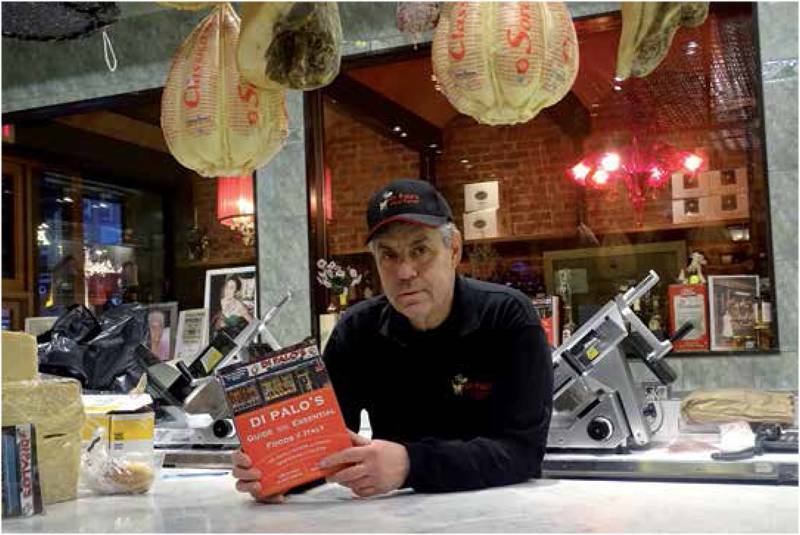 The book shares this Italian passion with American consumers and at the same time shares the story of the Di Palo family, and their 100 years in New York’s Little Italy. The Di Palo family is one of the oldest in the neighborhood. 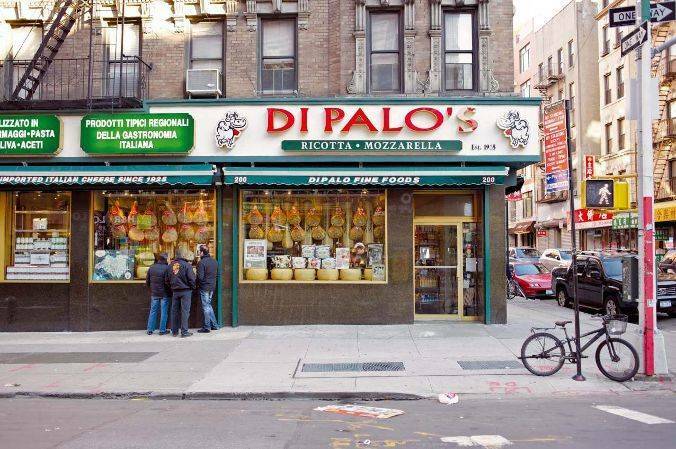 In the 1970s and 1980s Little Italy underwent drastic changes, and by 1990 Di Palo’s was almost the last Italian store left. Over the years it evolved from an immigrant ‘latteria’ to a full Italian store, from a traditional Italian-American store, to an ambitious Italian-Italian store. Lou Di Palo strived to make his store ”a shining jewel” in a neighborhood that was changing, while not letting those changes affect him or his Italian spirit. After World War II, Lou and his father decided it was time to increase the product line: from just simple cheese and other dairy products they started to carry pasta, salami and soppressata. In the sixties they bought an ‘affettatrice’ and started to slice cured meat the Italian style. Little by little the store begun to cater for the Italian Americans and became an anchor in the area. Then, when 40 years ago Lou started traveling to Italy, he discovered how much he didn’t know about Italian foods. He soon made it his mission to learn everything he could about what they sold: “to bring the right product to the people, the way it’s supposed to taste”. He felt the need to know and understand the foods better in order to be true to his customers, so that spending a lot of time in Italy, ‘breaking bread with the Italians’, became an essential step in the process. A passion for food was what Di Palo wanted to share: “In America we always ate to live, while Italians live to eat, appreciating every facet of their food, wanting to know where the cheese was made, what milk was used, and about the soil and the grass the cows, sheep or goats fed off; they want to know about the type of olives used for their olive oil and why Prosciutto di Parma has this aroma and is different from San Daniele. And we can’t help but notice that almost every time we visit, Lou is working behind the counter, and he tells us that this is where he belongs. He loves it and is proud of it. He wants the customers to have a good shopping experience and does his best to achieve it. The book is informative and an easy read. It’s about the products, but also about relationships, about how food brings people together: it’s the essence of Italian food. 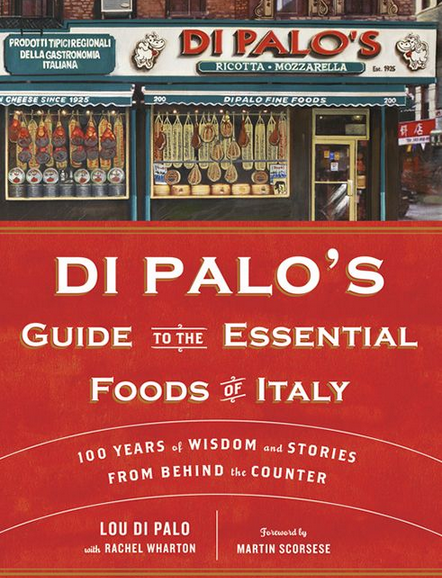 In his foreword to Di Palo’s Guide to the Essential Foods of Italy, Martin Scorsese notes that he “grew up eating Di Palo’s food” and after reading the book, di Palo says, Scorsese “enjoyed it so much that he was proud to give it as a Christmas present.” If Scorsese writing the forward was a honor, the biggest honor was that he wanted to give it as a gift. After introducing Little Italy and the history of the Di Palo family, the book highlights the diversity of the Italian regions. It then presents, one by one, the Italian essentials: mozzarella, pecorino, ricotta, sea salt (sale marino), anchovies, pasta and prosciutto, “one of the gifts of God”. It delves into the similarities and differences between Grana Padano and Parmigiano Reggiano; and suggests how to select good olive oil. There is a whole chapter dedicated to coffee, and Lou learned about it from one of the best, Ernesto Illy. He unveils all the secrets to identifying good coffee beans and using them to make a rich and intense cup of coffee. The last chapter is about the region of Trentino-Alto Adige, and Lou presents it through speck, the cured prosciutto that is air dried and salted in the southern Mediterranean fashion, but then also smoked following the Germanic tradition of the area. It’s the finest example of the fusion of the two cultures in the region. But what makes this book stand out are not just the fine products presented, the invaluable tips on how to select and store them, the family recipes and the mouth-watering photographs… It’s the stories that come to life through them, the people and worlds we are introduced to during the narration. People whom Lou met along the way and developed relationships with: it’s that very Italianità that adds that unique and unmistakable flavor to the already phenomenal food. Lou is certainly proud of what his family brought to this country and he took it to the best level he could. Each Di Palo generation also took it to a different level: they went from his great-grandfather’s store of 400 square ft to the current one of over 2000. But if you ask him about his future plans, Lou has a clear-cut answer: “How much more can I grow in my lifetime? If our children want to make it bigger or want to expand, I’ll be supportive. But I’ve done enough. Just like my father said when he handed me the keys: I won’t do anymore.” The next step is up to the new generation.